Classical theories of hedonic adaptation assume that lasting changes in subjective well-being (SWB) are not possible because one’s SWB inevitably returns to its baseline level, a phenomenon known as the hedonic treadmill. This baseline level is sometimes referred to as the set point for SWB and is assumed to be primarily determined by heritable factors. In this chapter, we review classical theories on hedonic adaptation: adaptation-level theory, range-frequency theory, hedonic relativism and the hedonic treadmill, opponent-process theory, the concept of the genetically determined set point, the distinction between desensitization and shifts in adaptation levels, and dynamic equilibrium theory. We then review the empirical evidence on these theories, with a focus on longitudinal studies on the heritability and stability of SWB, on changes in SWB after life events, and on the effectiveness of SWB interventions. Together, the empirical evidence suggests that although SWB is stable for most people, lasting changes are nevertheless possible. Recent theoretical developments such as the revised set-point theory, SWB homeostasis theory, and the hedonic adaptation prevention model offer different explanations for these findings. The chapter concludes with a discussion of four central questions that need to be addressed in future research. A quick stroll through the self-help section of any average bookstore conveys a clear message: Happiness is attainable anytime and for anyone, if one only chooses the right lifestyle. Although there is considerable disagreement on which lifestyles are particularly good for happiness, with options ranging from meditating to finding fulfilling relationships to achieving material success, the common theme of this industry is that happiness and well-being can be changed. For decades, scholars of happiness and well-being begged to differ. The science of happiness and well-being was for a long time dominated by the notion that our individual level of well-being is primarily determined by our genes, that we adapt to any changes in life circumstances rapidly and completely, and that any attempts to improve our happiness are futile. This notion has been proposed under various labels, including adaptation level (Helson, 1948, 1964), hedonic treadmill (Brickman & Campbell, 1971), dynamic equilibrium (Headey & Wearing, 1989, 1992; Solomon & Corbit, 1974), set point (Lykken & Tellegen, 1996), and hedonic adaptation (Frederick & Loewenstein, 1999), and became such a fundamental part of this field of research that some likened it to a research paradigm (Headey, 2008b). In the 2000’s, however, a series of longitudinal studies examining changes in life satisfaction after major life events such as widowhood, marriage, divorce, or unemployment (summarized in Lucas, 2007a) challenged the assumption that people can adapt to any circumstances and initiated a paradigm shift (Headey, 2008b). It is now widely accepted that while most people experience stable levels of happiness and well-being, significant and lasting changes can, and do, occur (Sheldon & Lucas, 2014). The present chapter recounts this paradigm shift and provides an overview of past and current theories and empirical research. It begins with a review of historical and philosophical accounts, followed by a presentation of the main classical theories. We then review empirical evidence for these theories, focusing on longitudinal studies, and discuss recent and current theoretical developments that have been prompted by the empirical evidence. The chapter concludes with a discussion of open questions and directions for future research. In many cultures and languages, the word “happiness” appears as a synonym for luck and fortune. This reflects an ancient view of the world as a place governed by an external power where there was little human beings could do to improve their conditions (McMahon, this volume). The pursuit of happiness consequently was a worthless task for humans. Since they are subject to the change of fate and fortune, humans should not even strive for happiness. In accordance with this idea, the pursuit of happiness has often been compared to Sisyphus’ task: No matter how hard we try to be happier, we will always go back to our previous level of happiness. Sisyphus, a figure in Greek mythology, was condemned to rolling an immense stone up a hill, only to watch it roll down again and again for eternity. Whether this notion is true has been a point of debate since the days of the religions traditions and the Ancient Greece (McMahon, this volume). In contrast to the very early idea of happiness as merely governed by luck, most Hellenistic philosophers believed that happiness and well-being can change but differed in what causes these changes. For example, Democritus suggested that happiness does not depend on fortune and external circumstances, but resides in people’s cast of mind. Epicurus was the first to propose that the best way to improve our human lives is to have pleasure and to avoid pain. In contrast, Seneca, as a Stoic, believed that virtue alone was sufficient for happiness. Aristotle thought that happiness is achievable by anyone living a virtuous life but admitted that fortune and external circumstances play a big role in human happiness. In sum, even if they differed on what happiness is and how it can be achieved, all the great ancient school of philosophy agreed that the possession of certain material goods, such as money, cannot guarantee that one’s well-being increases beyond a certain threshold. Most importantly, they also agreed that the determinants of happiness lay within individuals, in that only one’s moral and rational behaviors lead to happiness (Haybron, 2008a; McMahon, 2006; Tatarkiewicz, 1976). Similar to Greek philosophers, Christian philosophers of the Middle Ages believed that virtue was indispensable for happiness, but in contrast to Greek philosophers, they believed that happiness lays in the hands of God and could only be attained by leading a life inspired by faith in God (McMahon, 2006). The idea of happiness as something that humans have the power to achieve spread again in the Age of Enlightment. The concept of happiness assumed a subjective connotation, and pleasure was all that mattered for a happy life. At the beginning of 18th century, John Locke declared that happiness is the utmost pleasure of which we are capable, thereby implying that we are able to change our happiness. In this spirit, the United States Declaration of Independence of 1776 granted the pursuit of happiness as an unalienable right. The notion that happiness (in terms of pleasure) was achievable was also unquestioned by the Classical Utilitarians, Jeremy Bentham and John Stuart Mill, who argued that we ought to maximize the total amount of happiness, that is, bring about ‘the greatest amount of happiness for the greatest number’. In sum, most of these philosophers agreed that lasting happiness is at least in principle attainable. The concept of adaptation is, however, discussed in contemporary treatises on happiness and well-being which usually integrate philosophical thinking with empirical research findings. A common notion in contemporary philosophy is that even if there is a set level of happiness, there are still opportunities for us to improve our level of happiness (e.g., Haybron, 2008b). Most psychological theories relate to aspects of happiness and well-being that can be counted as components of subjective well-being (SWB), and we therefore focus on this construct for the remainder of the chapter. According to Diener (1984), SWB comprises cognitive components such as life satisfaction and satisfaction with specific life domains (also referred to as cognitive well-being) as well as affective components such as the frequency of positive affect (PA) and negative affect (NA) (also referred to as affective or emotional well-being and comprising both mood and specific emotions). In general, adaptation describes a process through which systems change their sensitivity to external stimuli. For example, our eyes are able to adapt to varying lighting conditions. When we enter a dark room, we are almost blind at first, but within minutes, our eyes adapt to darkness and we are able to perceive more and more details. In his adaptation-level theory, Helson (1948, 1964) proposed a mathematical model of adaptation. The main concept in this theory is the adaptation level, which is defined as the level at which a stimulus evokes a neutral response. The adaptation level determines whether stimuli are experienced as positive (above the adaptation level), neutral (at the adaptation level), or negative (below the adaptation level). For example, an object is experienced as heavy if its weight is above a person’s adaptation level, and as light if its weight is below a person’s adaptation level. According to Helson (1948), the adaptation level is a function of the weighted geometric mean of all past stimuli. A person who lifted primarily light objects in the past would therefore have a lower adaptation level than a person who lifted primarily heavy objects in the past. Each new stimulus is factored into this equation, which means that the adaptation level is not fixed but can change. A shift in the adaptation level then influences how future stimuli are evaluated. For example, if a person with a low adaptation level for perceiving weights is required to lift a number of heavy weights, his or her adaptation level should move upwards. This shift affects how objects lifted in the future are evaluated. Objects that were initially above the adaptation level and therefore had been perceived as relatively heavy might then be below the adaptation level and be perceived as relatively light. Although adaptation-level theory was originally developed and tested with respect to perception, Helson (1964) explicitly argued that his theory is generalizable to other psychological experiences. With respect to SWB, the main implication of adaptation-level theory is that changes in stimuli lead to changes in what is perceived as neutral (i.e., adaptation level) such that despite changing stimuli (i.e., circumstances), people inevitably revert to a point of neutrality over time. On average, people should therefore experience SWB that is neither positive nor negative. Similar to adaptation-level theory, range-frequency theory (Parducci, 1968, 1995) offers a mathematical formulation of how people evaluate hedonic and non-hedonic stimuli. Just like adaptation-level theory, range-frequency theory assumes that novel stimuli are compared to past stimuli. In contrast to adaptation-level theory, however, range-frequency theory predicts that a novel stimulus is not evaluated against the mean of the value of past stimuli but with respect to two parameters of the distribution of the value of past stimuli: range and frequency. The range principle posits that a stimulus is compared to the minimum and maximum of the distribution of previous stimuli. The closer a novel stimulus lies to the maximum of the range (i.e., to the most positive past stimulus), the more positively it is evaluated. The frequency principle posits that a novel stimulus is evaluated with respect to the frequency of previous stimuli below the novel stimulus. The more stimuli lie below the novel stimulus, the more positively the novel stimulus is evaluated. To illustrate these principles and to highlight the difference between adaptation-level theory and range-frequency theory, consider an example where the value of past stimuli follows the positively skewed distribution shown in Figure 1 and the value of a novel stimulus corresponds exactly to the mean of previous stimuli. According to adaptation-level theory, this stimulus would be evaluated as neutral because its value is equal to the adaptation level. According to the range principle, this stimulus would be evaluated negatively because it lies in the bottom half of the range. According to the frequency principle, in contrast, this stimulus would be evaluated positively because more than half of the previous stimuli were even more negative. Hence, the range principle and the frequency principle can lead to divergent evaluations and therefore have to be weighed against each other when evaluating new stimuli. In sum, range-frequency theory differs from adaptation-level theory (Helson, 1948, 1964) in that it explicitly assumes that not all past stimuli are equally important in predicting how people react to new stimuli. Figure 1. Illustration of adaptation-level theory and range-frequency theory. The figure shows the distribution of past stimuli which in this example is positively skewed. The solid vertical line indicates the geometric mean (M) of past stimuli, i.e. the adaptation level as defined in adaptation-level theory. The dashed vertical line indicates the median (Md), i.e. the value that splits the distribution into two equally-sized halves. 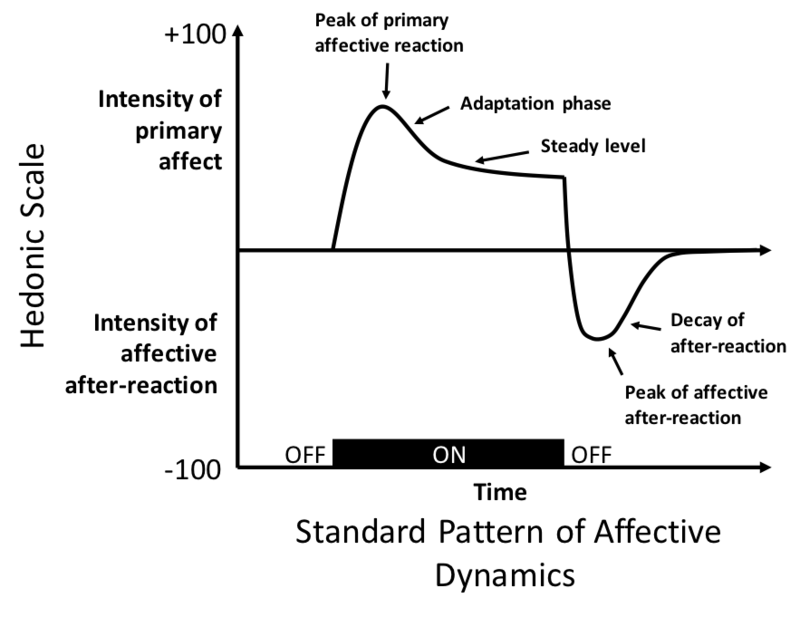 The dotted vertical line indicates the midpoint of the entire range of past stimuli. A novel stimulus with a value corresponding exactly to the mean (M) would be evaluated as neutral according to adaptation-level theory because it is identical with the adaptation level. According to the frequency principle, it would be evaluated positively because it is more positive than the median. According to the range principle, it would be evaluated negatively because it is more negative than the range midpoint. Brickman and Campbell (1971) were among the first to systematically apply adaptation-level theory to hedonic experiences. They proposed that people experience pleasure and satisfaction when they are confronted with stimuli that are more positive than their hedonic adaptation level, and they experience pain and dissatisfaction when they are confronted with stimuli that are more negative than their hedonic adaptation level. These stimuli are then integrated into the hedonic adaptation level, leading either to an upward or a downward shift in what people experience as hedonically neutral. The satisfaction or dissatisfaction elicited by a particular stimulus therefore fades over time, and people inevitably revert to a level of hedonic neutrality. Permanent happiness or satisfaction can thus only be achieved through a constant stream of novel positive stimuli – an endeavor that Brickman and Campbell described as a hedonic treadmill. 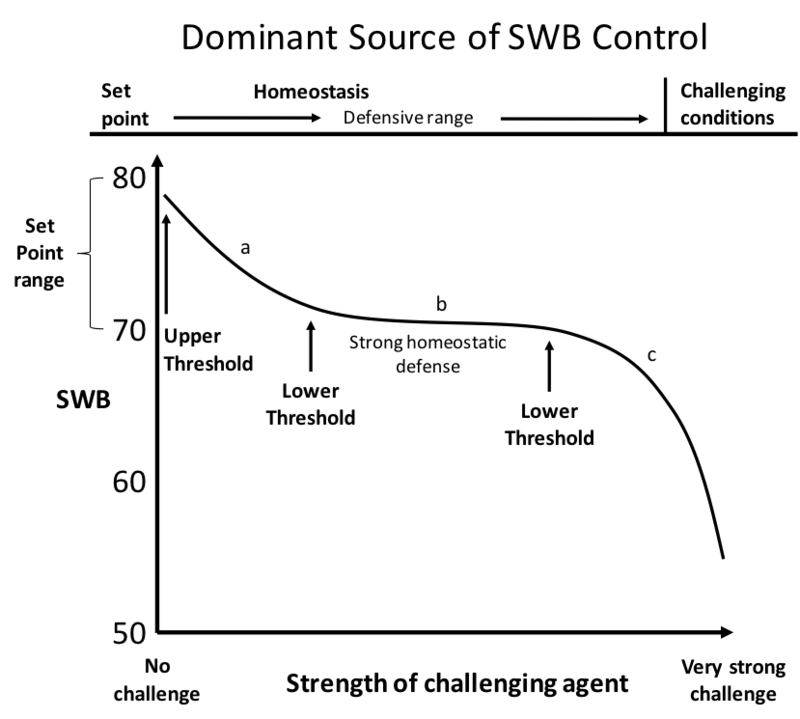 Expanding Helson’s (1948, 1964) original ideas, Brickman and Campbell (1971) further proposed that a new stimulus is not only compared to one’s past experiences (temporal comparisons), but also to one’s experiences in other life domains (spatial comparisons) and to experiences made by other people in one’s social network (social comparisons). Social comparisons are assumed to be particular powerful. For example, whether receiving one’s monthly salary is experienced as hedonically positive, negative, or neutral depends not only on one’s previous salaries (the salary would be experienced as positive if it were higher than before) but also on the salary of similar people (e.g., the salary would be experienced as negative if it were still lower than the salary of one’s co-workers). Brickman and Campbell realized that the hedonic treadmill has serious individual and societal implications. On the individual level, it implies that “subjective pleasure is, as a state, by its very nature transient and, as a goal, an ever-receding illusion” (Brickman & Campbell, 1971, p. 289) unless one manages to get off the hedonic treadmill by “abandoning all evaluative judgments” (Brickman & Campbell, 1971, p. 300). They also infer that high SWB would be easiest to attain for those with particularly low hedonic adaptation levels because almost all stimuli would be experienced as positive. Thus, they conclude, “the happiest adult is one who had a moderately unhappy childhood” (Brickman & Campbell, 1971, p. 293) and who remembers these unhappy moments occasionally in order to maintain a permanently low hedonic adaptation level. On the societal level, the hedonic treadmill implies that any policy interventions aimed at improving a population’s SWB are doomed to fail because people adapt to any changes in their life circumstances. This conclusion was backed up by the Easterlin Paradox which describes the observation that national happiness levels remain constant across time despite rising income levels (Easterlin, 1974). Similar to the theories discussed thus far, opponent-process theory (Solomon & Corbit, 1974) assumes that the hedonic impact of any stimulus on SWB is brief and that people eventually return to a state of hedonic neutrality. The most important contribution of opponent-process theory lies in spelling out how this return to baseline unfolds over time. Solomon and Corbit (1974) propose that the standard hedonic response to a stimulus can be split into five stages (Figure 2). (1) Stimulus onset is associated with an immediate pleasant or unpleasant primary reaction, which peaks shortly after stimulus onset. (2) Over time, the intensity of the hedonic reaction declines through adaptation, even if the stimulus remains present. (3) The hedonic reaction then stabilizes on a non-neutral level as long as the stimulus remains present. (4) Once the stimulus is terminated, an opponent process kicks in. This so-called affective after-reaction is opposite to the primary reaction (e.g., negative if the primary reaction was positive) and peaks shortly after the stimulus is terminated. This pattern is sometimes referred to as the overshoot effect. The opponent process is activated automatically and indirectly through the primary reaction and constitutes a physiological response to the primary reaction. (5) The opponent process weakens over time and the affective state returns to its initial neutral level (hedonic equilibrium). Figure 2. Five stages of the hedonic response to a stimulus according to opponent-process theory (Solomon & Corbit, 1974). Figure adapted from Solomon and Corbit (1974, p. 120, Figure 1). To illustrate this pattern, imagine a young couple on one of their first dates. When they first see each other, they experience intense joy and excitement (primary reaction). Over the next hours, the intensity of these emotions declines (adaptation) but they remain in a generally positive hedonic state. However, when they part ways, the automatic opponent process takes over, leaving them sad and longing for each other’s company. These negative emotions are most intense immediately after the separation and decline again over time until both return to their initial state of hedonic equilibrium. The existence of opponent processes has several important implications. First, this theory is unique among all classical theories discussed here in its emphasis of the role of time. Because the affective reaction to a stimulus unfolds in a highly complex and dynamic pattern over time, its trajectory can only be described adequately if multiple repeated measures that cover each of the five stages are available. Cross-sectional studies and longitudinal studies using inappropriate time points and intervals between measurement occasions may lead to wrong conclusions because they may confound primary and opponent processes. A study of the affective impact of a romantic date would come to vastly different conclusions if the affective reactions of the couple were measured shortly after the date began, shortly after it ended, or a few days later when both had returned to hedonic neutrality. Second, this theory implies that any stimulus can cause both positive and negative reactions, either as the primary process or as the opponent process. Although opponent-process theory has been developed to describe the short-term dynamics of affect, this implication may also apply to more long-term dynamics of SWB, for example in the context of major life events. We conclude this section with highlighting additional differences between opponent-process theory on one hand and adaptation-level theory and its spin-offs on the other. All of these theories assume that stimuli are evaluated relative to the baseline level, which they refer to as adaptation level (adaptation-level theory) or hedonic equilibrium (opponent-process theory). However, adaptation-level theory and related accounts propose that this level can change as a function of previous related stimuli whereas opponent-process theory implies that this level remains unchanged (cf. Bowling, Beehr, Wagner, & Libkuman, 2005). Furthermore, only opponent-process theory explicitly assumes that the underlying processes are automatic and physiological. Hence, while all theories assume that people experience, on average, hedonic neutrality, they differ fundamentally in their assumptions about the underlying processes through which hedonic neutrality is maintained. Headey and Wearing (1989, 1992) expanded previous theoretical accounts by adding personality to the equation. According to their dynamic-equilibrium theory, each person has two types of equilibriums: a SWB equilibrium and a life-events equilibrium. The term equilibrium is used in a similar sense as by Solomon and Corbit (1974) and indicates that people’s levels of SWB as well as the frequency of positive and negative life events fluctuate over time, but they do so around a stable baseline – the equilibrium. Both equilibriums differ between individuals and are at least partly predicted by stable personality traits. Specifically, Headey and Wearing (1989, 1992) predict that high levels of SWB are predicted by high levels of extraversion and low levels of neuroticism—which is indeed one of the most robust findings in SWB research (DeNeve & Cooper, 1998; Steel, Schmidt, & Shultz, 2008). Dynamic-equilibrium theory therefore deviates from previous theoretical accounts in that it does not assume that all people experience, on average, hedonic neutrality but posits that (a) the average level of SWB is positive and (b) there are individual differences in SWB. Dynamic-equilibrium theory further assumes that people differ in their typical patterns of life events because life events are not completely random (i.e., exogenous), but at least partly driven by personality characteristics (i.e., endogenous). Specifically, Headey and Wearing propose that high extraversion is associated with experiencing more positive events, high neuroticism is associated with experiencing more negative events, and high openness to experiences is associated with experiencing both more positive and more negative events, relative to low levels on these three traits. Personality therefore stabilizes levels of SWB through two pathways: through its direct impact on people’s disposition to experience low or high SWB and through its indirect impact on what kind of life events people experience. Headey and Wearing further predict that life events do not change people’s levels of SWB per se but only if they deviate from the normal equilibrium of life events. For example, a positive event should not have much impact on a person’s SWB who experiences positive events all the time, but it should lead to a temporary improvement in SWB in a person who rarely experiences positive events. Over time, however, people adapt even to these kinds of changes because their personality pulls both their SWB and the frequency of events back to their respective equilibrium levels (Headey & Wearing, 1992). Dynamic-equilibrium theory differs from previous theories in three important aspects. First, this theory allows and explains individual differences in both SWB and stimuli (here: life events). Second, it drops the notion of a neutral baseline to which people revert. Finally, it includes personality as a major driver of individual differences and adaptation. Headey and Wearing (1989) provided preliminary support for their theory in a longitudinal study, but as we will see below, Headey (2008) later revised this theory substantially to account for divergent empirical findings. Despite their differences, the common notion of the theories discussed up to this point is that one’s level of SWB always returns to some kind of baseline or equilibrium. To date, this baseline is usually referred to as set point, a term suggested by Lykken and Tellegen (1996). Using twin data, Lykken and Tellegen (1996) estimated that the stable component of SWB is 80% heritable. Although this seems like a strikingly high estimate, it is important to keep in mind that this estimate refers to the heritability of the stable component of SWB only. Lykken and Tellegen (1996) do in fact acknowledge that SWB can be and should be expected to be highly volatile across time. Nevertheless, their conclusions centered on the high heritability of SWB, and this paper was typically cited in this context. In the same study, Lykken and Tellegen (1996) also found that the individual level of SWB was better predicted by the twin’s level of SWB than by the individual’s sociodemographic characteristics, leading them to the conclusion that the effects of life circumstances on SWB are negligible and that individual differences in SWB are primarily determined by genetic factors. Although they were not able to test this assumption in their study, Lykken and Tellegen (1996) assumed that how happy one can be depends on one’s happiness set point, which they assumed to be heritable and stable across time. This term was quickly adopted by others to describe theories of SWB that assumed that people adapt to any changes in life circumstances. This function follows an S-shaped curve (Kahneman & Tversky, 1979) (see solid blue curve in Figure 3A). The valence of the stimulus is depicted on the x-axis, with X = 0 corresponding to the adaptation level, and the hedonic response is depicted on the y-axis. As the curve illustrates, the hedonic response is particularly sensitive to differences in stimuli that are close to the adaptation level (steep slope in the middle of the plot) and less sensitive to differences in stimuli that are far from the adaptation level (flat slope at both ends of the plot). This phenomenon is known as declining marginal utility in economics (Kahneman & Thaler, 2006; Kahneman & Tversky, 1979). The constant c is reflected in the intercept of the curve (i.e., the hedonic response at X = 0): An inherently good stimulus with a positive value for c will elicit a positive response even if its valence is exactly at the adaptation level. Figure 3. Illustrations of the S-shaped hedonic response curve according and changes in the hedonic response due to shifting adaptation levels (Panel A), and desensitization and sensitization (Panel B), as proposed by Frederick and Loewenstein (1999). This formalization of the relationship between a stimulus and the hedonic response allowed Frederick and Loewenstein (1999) to distinguish two different processes of hedonic adaptation. First, the hedonic response to a stimulus may become weaker because of shifting adaptation levels, as proposed by Helson (1948), Parducci (1968, 1995), and Brickman and Campbell (1971). The shift in adaptation level would result in an upward or downward shift of the hedonic response curve. For example, a downward shift of the hedonic response curve would imply that a stimulus that once elicited a positive hedonic response now elicits a neutral or even negative response (see black dashed line in Figure 3A). Second, the sensitivity towards differences between stimuli may weaken. This desensitization would result in a flatter slope of the hedonic response curve, and positive stimuli would elicit an attenuated hedonic response (dotted line in Figure 3B). 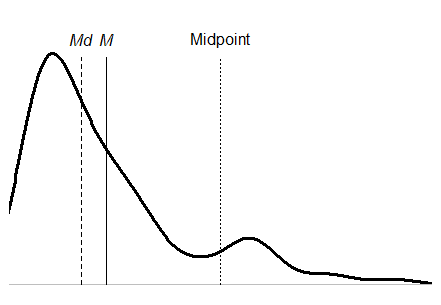 The slope of the hedonic response curve could also change in the opposite direction, leading to sensitization towards stimuli (dashed line in Figure 3B). Note that there is some disagreement in the literature on whether both of these processes reflect hedonic adaptation. Frederick and Loewenstein (1999) clearly think so, as they define hedonic adaptation as “anything that reduces the subjective intensity of a given stimulus” (p. 303). Others, however, explicitly draw a line between adaptation (i.e., shifts in adaptation levels) and desensitization (Armenta, Bao, Lyubomirsky, & Sheldon, 2014; Cummins, 2014). Classical theories on adaptation converge on the assumption that external factors do not have lasting effects on SWB because people adapt to any changes in external factors. Hence, although observed SWB can fluctuate, the average long-term level of SWB is stable. This long-term level of SWB has been termed adaptation level (Brickman & Campbell, 1971; Helson, 1948, 1964), dynamic equilibrium (Headey & Wearing, 1989, 1992; Solomon & Corbit, 1974), and set point (Lykken & Tellegen, 1996), which is the term that we will use for the remainder of the chapter. These basic assumptions lead to the following testable hypotheses. (1) Because the set point is genetically determined, SWB should be highly heritable and be correlated more strongly with other heritable factors such as personality than with presumably non-heritable external factors such as life circumstances. (2) Because the set point cannot change, SWB should be highly stable across time both in terms of rank-order stability and in terms of mean-level stability. (3) Because people always return to their set points, external stimuli such as major life events or interventions should have only short-term effects on SWB. In the following section, we review the empirical evidence for these hypotheses. Early studies of hedonic adaptation often relied on non-experimental cross-sectional data from small samples. In this section, we first explain why hypotheses about adaptation cannot be tested adequately with these kinds of studies, but only with studies using longitudinal studies. We then review studies examining (a) the stability and heritability of SWB, (b) the association between changes in life circumstances (e.g., life events) and changes in SWB, and (c) the effectiveness of interventions aimed at improving individual SWB (for a similar comprehensive review, see Tay & Kuykendall, 2013). Before longitudinal data became widely available, researchers of hedonic adaptation usually relied on two types of indirect evidence. The first type of evidence came from cross-sectional correlational studies that tried to explain individual differences in SWB with various correlates. Such studies usually found that personality accounted for a substantially higher proportion of the variance in SWB than life circumstances such as marital status, employment status, or income, leading many to conclude that one’s level of SWB is primarily determined by one’s personality and that the effects of life circumstances are negligible (for reviews, see Argyle, 1999; Diener, Suh, Lucas, & Smith, 1999; Myers & Diener, 1995). Such a conclusion, however, is problematic for several reasons. First, cross-sectional correlations only refer to momentary rank-order differences between individuals. It is impossible to infer whether these differences are stable across time and whether changes in the predictors (e.g., changes in life circumstances) are associated with changes in SWB within individuals. Second, weak correlation coefficients may conceal practically significant effects. For example, the correlation between individual income and individual SWB is typically around .30 (Howell & Howell, 2008), which means that income explains about 9 % of individual differences in SWB. This seemingly low figure conceals that the SWB differences between poor and rich individuals can be substantial (Lucas & Schimmack, 2009). Finally, equating personality influences with stability is misleading because personality can change across the entire life span (Roberts, Walton, & Viechtbauer, 2006; Specht et al., 2014). The second type of evidence came from studies that compared the average level of SWB among groups that differed in whether they had recently experienced major changes in their lives. A citation classic in this category is the study by Brickman, Coates, and Janoff-Bulman (1978). In this study, a group of lottery winners and a group of paraplegic accident victims were compared to a control group that had not recently gone through any major life changes. Lottery winners were not significantly happier than participants in a control group. Accident victims were unhappier than both lottery winners and control participants, but happier than “might have been expected” (Brickman et al., 1978, p. 921) because their average happiness level was above the neutral midpoint of the scale. Together, these findings seemed to suggest that major life events do not have any lasting effects on SWB, presumably because people adapt quickly and completely. However, this interpretation is false: (a) The sample size was rather small (N = 22 for lottery winners, N = 29 for accident victims, and N = 22 for controls), so weak effects were unlikely to be detected. (b) Despite these relatively small sample sizes, the mean-level difference between accident victims and controls was statistically significant and quite strong in terms of effect size (d = 0.75; Diener, Lucas, & Scollon, 2006). (c) The study was cross-sectional, making it impossible to judge whether these differences were caused by the event or had existed before. The latter point reveals a more general problem with these types of cross-sectional studies. Mean-level differences in SWB after life events only allow conclusions about the impact of a life event if there were no differences in SWB before the events. Without data on SWB collected before the event, this assumption cannot be tested. In fact, multiple studies suggest that life events are not completely random but at least partially associated with person characteristics such as personality (Headey & Wearing, 1989; Kandler, Bleidorn, Riemann, Angleitner, & Spinath, 2012; Lüdtke, Roberts, Trautwein, & Nagy, 2011; Magnus, Diener, Fujita, & Pavot, 1993) and even the previous level of SWB (Luhmann, Lucas, Eid, & Diener, 2013). In conclusion, non-experimental cross-sectional studies are inconclusive with respect to whether, when, how fast, and for whom hedonic adaptation occurs. For this reason, the following review of the empirical evidence focuses on longitudinal studies. A central hypothesis in set-point theory is that SWB fluctuates around a stable, genetically determined set point (Headey & Wearing, 1992; Lykken & Tellegen, 1996). This hypothesis implies that long-term levels of SWB should be highly heritable and stable across time. To probe to what extent these predictions are confirmed in empirical studies, we first review the current state of research on the heritability and then discuss studies on the rank-order and mean-level stability of SWB. Heritability of SWB. Heritability refers to the proportion of the total variance of a variable (i.e., phenotype) that is accounted for by genetic factors and is usually estimated using behavioral genetic designs such as twin studies (Plomin, DeFries, Craig, & McGuffin, 2003). Across studies, the average heritability of SWB is between .30 and .40 (Bartels, 2015; Nes & Røysamb, 2016; Røysamb & Nes, this volume), which is slightly below the heritability of personality which is estimated to be between .40 and .50 (Bleidorn, Kandler, & Caspi, 2014). However, some studies also found much lower and much higher heritability estimates. Specifically, heritability estimates of momentary affect are typically lower (between .00 and .35; Eid, Riemann, Angleitner, & Borkenau, 2003; Riemann, Angleitner, Borkenau, & Eid, 1998) and heritability estimates of the long-term SWB are typically considerably higher (between .70 and .95; Lykken & Tellegen, 1996; Nes et al., 2013; Nes, Røysamb, Tambs, Harris, & Reichborn-Kjennerud, 2006). Hence, fluctuations in day-to-day affect appear to be mainly driven by environmental factors whereas long-term SWB appears to be mainly influenced by genetic factors. The latter conclusion is consistent with set-point theory (Lykken & Tellegen, 1996). Several caveats of these studies need to be considered when interpreting these findings (Røysamb, Nes, & Vittersø, 2014). First, estimates of heritability depend on a number of assumptions which are often not met in reality. One of these assumptions is that the parents of twins are matched randomly. However, several studies found evidence for assortative mating with regard to SWB such that spouses often have similar levels of SWB (e.g., Hoppmann, Gerstorf, Willis, & Schaie, 2011; Schimmack & Lucas, 2010). Moreover, estimates of heritability depend not only on the amount of genetic variance, but also on the amount of environmental variance in a population. Estimates of heritability are higher in environmentally homogeneous populations (e.g., populations with similar sociodemographic background) than in environmentally heterogeneous populations (e.g., different cultures), even if the effect of the genetic factors is identical (Røysamb et al., 2014). Second, even if one accepts that the heritability of long-term SWB is as high as suggested by some of the studies mentioned above, this figure does not automatically imply that we have genetically fixed set points to which we return no matter the circumstances. As Røysamb et al. (2014) discuss in more detail, even monozygotic twin pairs tend to differ from one another in their levels of SWB, suggesting that it may be more appropriate to think of the set point in terms of a range of values rather than a single fixed value. Life events or interventions may cause individuals to experience permanent levels of SWB that are above or below the middle of the set point range. Adaptation, defined as a return to baseline, is therefore not inevitable. Furthermore, gene expression changes over the life course, which means that different genes might be effective in different circumstances and different life stages (Nes, 2010; Røysamb et al., 2014). Even if the set point is genetically determined, it is not necessarily fixed to a specific value that remains the same across the entire life span (Røysamb et al., 2014). In sum, behavioral genetics studies suggest that SWB is at least partly influenced by genetic factors, particularly if long-term SWB is considered, but these findings do not imply that hedonic adaptation is quick and inevitable. Rank-order stability of SWB. Under the assumption that individual differences in SWB exist (Headey & Wearing, 1989, 1992; Lykken & Tellegen, 1996), a further implication of the classical adaptation theories is that the rank order of individuals should be stable across time. If Person A has a higher set-point for SWB than Person B, then Person A should have higher observed levels of SWB than Person B at any given point in time. This rank-order stability is estimated by the retest correlation between observed SWB scores measured at Time 1 and observed SWB scores measured at Time 2. For most psychological variables, the retest correlation is highest when the time lag between the two time points is minimal and decays with increasing time lags until it reaches an asymptote that is typically above 0 (Fraley & Roberts, 2005). The decay reflects the cumulative effect of changing environmental factors and the asymptote reflects the effect of the stable component of the variable. Thus, the higher the asymptote, the stronger is the influence of stable factors such as a genetically determined set point. The rank order of SWB has been examined in multiple studies, with retest intervals ranging from a few days to 10+ years. Meta-analyses of these studies found that both life satisfaction and affect follow the pattern described above, with retest correlations decreasing over time until they reach an asymptote of about r = .30 (Anusic & Schimmack, 2015; Schimmack & Oishi, 2005). For comparison, the asymptote for retest correlations of personality is about r = .60 (Anusic & Schimmack, 2015), indicating that SWB is substantially less stable than personality. If more than two waves of data are available, the relative contribution of stable and changing factors can also be estimated with structural equation models for longitudinal data (Cole, Martin, & Steiger, 2005; Kenny & Zautra, 1995). Such models allow decomposing the total variance into components that are due to stable influences, occasion-specific (momentary) influences, and in some models, autoregressive influences (i.e., effect of the SWB at the previous occasion on SWB at the following occasion). Using data from representative panel studies, Lucas and Schimmack (2009) estimated that stable, autoregressive, and occasion-specific influences each account for roughly one third of the total variance in life satisfaction. In their meta-analysis, Anusic and Schimmack (2015) estimated that stable influences account for 42 % of the variance in affect and 52 % of the variance in life satisfaction (see also Eid & Diener, 2004, for similar estimates), compared to 83 % for personality. In sum, these findings suggest that while a substantial proportion of the variance of SWB is due to stable factors, which is consistent with the existence of a set point, SWB is also at least as much influenced by changing environmental factors. Similar to the findings on heritability, these studies do not provide any information on whether hedonic adaptation is indeed quick and inevitable. To examine whether people return to a stable baseline regardless of the external circumstances, stability and change in mean levels of SWB must be examined. Mean-level stability of SWB. If the assumption that people always return to their stable set points is correct, mean levels of SWB should be stable over longer time spans both on the population level and within persons. With regard to the population level, a frequent finding is that national levels of SWB change very little across long time spans, despite changes in sociodemographic circumstances such as national income levels (Easterlin, 1974). However, this pattern has primarily been replicated in countries that experienced relative stability in the past decades. By contrast, both upward and downward changes in national levels of SWB can be found in countries that experienced significant economic and political changes (e.g. Russia, Greece) (Veenhoven, 2014), indicating that stable population levels of SWB are not universal. Furthermore, classical theories of adaptation imply that SWB does not change across the life span. Again, however, the empirical evidence does not fully support this assumption. Both affective well-being (Charles, Reynolds, & Gatz, 2001; Lachman, Teshale, & Agrigoroaei, 2015) and life satisfaction (Baird, Lucas, & Donnellan, 2010; Mroczek & Spiro, 2005; Steptoe, Deaton, & Stone, 2015; Stone, Schwartz, Broderick, & Deaton, 2010) change over the life span (for a recent review on the development of SWB across the life span, see Luhmann, 2017) and decline in the last years of life, suggesting that people do not adapt fully to the cognitive and health-related decline that characterizes this period in life (Gerstorf et al., 2008; Kunzmann, Richter, & Schmukle, 2013). Together, these studies show that average levels of SWB can change over time, which is hard to reconcile with the classical theories of adaptation. Note, however, that studies on average mean-level change offer only limited insights into changes occurring within persons. In fact, moderately changing mean levels of SWB can reflect (a) that most people experience moderate changes in their individual SWB or (b) that most people do not experience any changes in their individual SWB but a significant minority experience strong changes. Similarly, stable mean levels of SWB can reflect (a) that individuals do not experience any changes in SWB or (b) that the number of individuals experiencing increases and decreases are roughly similar. Empirical studies considering interindividual differences in intraindividual change suggest that both explanations are somewhat true. Using longitudinal data on life satisfaction spanning up to several decades, several authors found that while most people experience stable levels of life satisfaction, a substantial minority of about 20 % experience significant and lasting increases or decreases over the multi-year period (Fujita & Diener, 2005; Headey, 2008b; Headey, Muffels, & Wagner, 2014). If hedonic adaptation is indeed inevitable, even major life events should not have any lasting impact on SWB. Two general methodological approaches to study the relationship between life events and SWB can be distinguished. In the first approach, the frequency of life events experienced over a specified time frame is measured, often with life events checklists such as the Social Readjustment Scale (Holmes & Rahe, 1967). For example, Headey and Wearing (1989) measured the frequency of positive and negative events experienced over a period of two years and found that these frequency measures predicted life satisfaction and positive affect over and above extraversion, neuroticism, and openness to experiences. In addition, the frequency of negative events, but not the frequency of positive events, predicted negative affect over and above extraversion, neuroticism, and openness to experiences. In another study using the frequency approach, Suh, Diener, and Fujita (1996) regressed momentary SWB on the number of positive and negative self-reported life events experienced in specific time periods over the past four years. They found that positive affect was significantly predicted by the number positive life events, negative affect was significantly predicted by the number of negative life events, and life satisfaction was significantly predicted by both positive and negative life events. Crucially, they also found that when the time point of the occurrence of these events was considered, only events experienced in the past three months, but not more temporally distal events, were significantly associated with SWB. Suh et al. saw their findings as consistent with Headey and Wearing’s (1992) dynamic equilibrium theory and concluded that “it seems to be the case that SWB does react to external changes in life but returns to a stable individual baseline rather quickly. More specifically, the results of our study indicate that the impact of most life events on SWB diminishes in less than 3 months” (Suh et al., 1996, p. 1098). This conclusion, however, is unwarranted given the study design. In fact, this study did not provide any evidence on whether people return to the set point at all nor on how quickly they do because the intraindividual trajectories of SWB were not examined. Instead, this study merely shows that individual differences in SWB cannot be predicted by the frequency of life events that occurred more than three months ago. An additional limitation of the frequency approach is that life events that differ quantitatively (in terms of their hedonic impact) and qualitatively (in terms of, for example, life domain or subjectivity) are lumped together in one single score, which means that the impact of specific events on SWB cannot be examined. This limitation is resolved in the second methodological approach that focuses on single specific events. Many studies focusing on single specific events compared individuals having experienced the event with individuals not having experienced the event (e.g., Brickman et al., 1978, for more examples, see the comprehensive review by Frederick & Loewenstein, 1999). However, as discussed above, these types of cross-sectional group comparisons do not allow conclusions about the impact of life events nor about the process of adaptation. The strongest approach to testing whether and how adaptation to external stimuli unfolds over time is therefore to examine intraindividual changes in SWB after life events using prospective longitudinal data. Data are prospective if SWB is measured both before and after the event. Only prospective data permit testing whether and how quickly people return to their pre-event (i.e., baseline) levels of SWB after the event. Prospective studies on life events are hard to conduct because they require repeated measures of SWB (to allow examining intraindividual change) from large samples (to ensure that a significant number of people experienced the event of interest) tracked over long time periods (to ensure that both pre-event and post-event data on SWB are available). Fortunately, such studies have increasingly become available. For example, the German Socioeconomic Panel Study (SOEP) provides longitudinal data on life satisfaction collected annually since 1984 in a large sample representative of the German population (Wagner, Frick, & Schupp, 2007). This study and similar ones from other countries have been used extensively to study changes in SWB in the context of family-related events such as marriage (Lucas, Clark, Georgellis, & Diener, 2003), childbirth (Dyrdal & Lucas, 2013; Galatzer-Levy, Mazursky, Mancini, & Bonanno, 2011), divorce (Lucas, 2005), widowhood (Lucas et al., 2003; Specht, Egloff, & Schmukle, 2011); work-related events such as unemployment (Galatzer-Levy, Bonanno, & Mancini, 2010; Lucas, Clark, Georgellis, & Diener, 2004; Luhmann & Eid, 2009), job transitions (Lindfors, Hultell, Rudman, & Gustavsson, 2014), and retirement (Pinquart & Schindler, 2007); and health-related events such as the onset of disability (Lucas, 2007b; Pagán-Rodríguez, 2012). Reviews (Lucas, 2007a; Yap, Anusic, & Lucas, 2014) and meta-analyses (Luhmann, Hofmann, Eid, & Lucas, 2012) of this literature indicate that whether and how fast people adapt to life events depends on the specific event. On average, people appear to adapt within a few years to marriage, childbirth, and divorce. Adaptation can also be found for widowhood and bereavement, although the rate of adaptation is slower than for divorce. For some events, however, changes in SWB are more permanent, for example after unemployment and disability. These results suggest that while adaptation is common, it is neither automatic nor inevitable, particularly after negative life events. Despite their many strengths, a number of limitations of these studies need to be considered. First, most studies only included individuals who had experienced a particular event but did not include a control group comprised of individuals who had not experienced this event. A control group is necessary to (a) examine selection effects (e.g., people high in SWB are more likely to get married; Mastekaasa, 1992) and (b) to disentangle event-induced changes from age-related normative changes. Ideally, individuals would be randomly assigned to the event group and the control group, but with few exceptions (e.g., Galiani, Gertler, & Undurraga, 2015), such a random assignment is ethically impossible. An alternative is propensity score matching (Thoemmes & Kim, 2011), a statistical procedure that can be used to a create control group that is matched with the event group. A study by Yap, Anusic, and Lucas (2012) demonstrates how the conclusions can change by including a control group: While they replicated previous findings that people return to their pre-event levels after marriage, they also observed similar declining levels of life satisfaction in a matched control group, suggesting that while marriage did not change people’s general downward trajectory of life satisfaction normal in this age period, it did give people a boost that kept them permanently above the life satisfaction level of the unmarried control group. Second, SWB was measured annually in most studies, which limits the possibility to detect short-term variations in SWB. As the meta-analysis on life events and SWB (Luhmann, Hofmann, et al., 2012) shows, variability in SWB is particularly high in the first months after a significant event, suggesting that the first weeks and months after an event may be particularly volatile. We return to this issue below when we discuss open questions and future directions. Third, most studies focused on life satisfaction. Only few longitudinal studies on changes in affective well-being are available. Distinguishing between these components is important because life satisfaction and affective well-being are differentially affected by life events (e.g., Knabe, Rätzel, Schöb, & Weimann, 2010) and change at different rates and, for childbirth, even in different directions (Luhmann, Hofmann, et al., 2012). Finally, both the reaction to life events and the rate of adaptation to life events vary substantially among individuals experiencing the same events and among different kinds of events. An active field of research is to identify the person-related and event-related moderators that account for this variability. We return to this issue below. In sum, studies on life events and SWB paint a complicated picture: adaptation seems to occur frequently for most events and most individuals, but not for everyone. Lykken and Tellegen (1996) famously stated that “it may be that trying to be happier is as futile as trying to be taller” (Lykken & Tellegen, 1996, p. 189). Unfazed by this quote, a number of researchers and practitioners have developed interventions that attempt just that: to improve people’s levels of SWB. This volume includes several chapters reviewing these interventions (Layous; Ehlers, Salerno, Aguiñaga, & McAuley; Stone & Parks; Chow; Holman, Johnson, & O’Conner, this volume), so we will not reiterate them here. For our purposes, it suffices to say that the empirical evidence available to date suggests that SWB can be improved through interventions (Bolier et al., 2013; Davis et al., 2016; Sin & Lyubomirsky, 2009) and through intentional activities (Layous, this volume), a finding that is inconsistent with classical theories of adaptation. In this section, we reviewed studies on heritability and stability of SWB as well as studies on the impact of external stimuli (life events and interventions) on SWB. Together, these studies indicate that SWB is relatively stable but nonetheless changeable. For most people, their SWB fluctuates around a stable baseline that is partly heritable, which is consistent with classical theories of adaptation. However, a significant minority experiences major increases or decreases in their SWB. In sum, adaptation is a real phenomenon, but it may not be as pervasive and inevitable as classical theories suggest. In reaction to the empirical evidence, Headey (2008b) announced a paradigm shift in this field of research and called for a revision of the classical set-point theories. A comprehensive theory of SWB, he states, needs to be able to explain both stability (which classical theories do) and change (which classical theories fail to do) (Headey, 2010). In this section, we review current theoretical developments that attempt to achieve this goal. Diener et al. (2006) and Headey (Headey, 2008b, 2010) independently argued that the classical theories of adaptation need to be fundamentally revised. Diener and colleagues (2006) proposed five major revisions. (1) Set points are not neutral, as assumed in some classical theories (Brickman & Campbell, 1971; Helson, 1948, 1964; Solomon & Corbit, 1974), but are, on average, positive (Diener & Diener, 1996; Diener, Kanazawa, Suh, & Oishi, 2015). (2) People differ in their individual set points, and these differences can partly be explained by heritable factors such as personality. (3) People may have multiple set points for different components of SWB. (4) SWB can change, for example through the experience of major life events. (5) People differ in the degree to which they adapt, and these individual differences can partly be explained by differences in personality and coping strategies. Headey was compelled to substantially revise his dynamic equilibrium theory (Headey & Wearing, 1989, 1992) which, in its original form, was able to explain stability but not lasting changes in SWB. Recall that a central proposition of the original dynamic equilibrium theory was that people’s levels of extraversion, neuroticism, and openness to experience predispose them to a characteristic pattern of life events. SWB changes not when particular life events occur, but when the pattern of life events deviates from the characteristic pattern of life events. For example, one would experience significant increases in SWB not by experiencing positive events per se, but by experiencing more positive events than normal. In his revision of this theory, Headey (2008b) suggests that such positive and negative deviations from the normal pattern of life events are more likely for individuals with certain combinations of personality traits. Specifically, he proposes that people who are at the same time high in extraversion and low in neuroticism have an ‘upside risk’ of experiencing more positive events than normal and thereby have a greater chance of experiencing lasting increases in SWB. Conversely, he proposes that people who are at the same time low in extraversion and high in neuroticism have a ‘downside risk’ of experiencing more negative events than normal and thereby have a greater risk of experiencing lasting decreases in SWB (for preliminary empirical support, see Headey, 2008b). Moving even further away from the original theory, Headey later proposed that lasting changes in SWB can also be due to people’s behavioral choices, for example, who they choose as a partner, how they balance work and leisure, their degree of social participation and volunteering, how physically active and healthy they live, and other life goals (Headey, 2008a; Headey, Muffels, & Wagner, 2010; Headey et al., 2014). This notion presents quite a dramatic shift away from the classical theories that all converged on the idea that people cannot influence their SWB because it is mainly determined by personality and by automatic adaptation processes. In a stark contrast to Headey’s revised set-point theory, Cummins (2010, 2014) continues to emphasize the role of automatic processes. In his theory of SWB homeostasis, Cummins posits that SWB, particularly mood, can be described as a homeostatic system. He specifically focuses on what he calls homeostatically protected mood (HPMood), a biologically determined and normally distributed predisposition for certain positive mood states that influences people’s personality (not vice versa), cognitive processes, and other aspects of SWB such as life satisfaction. HPMood is controlled by homeostatic processes that keep HPMood within a narrow range, the so-called set point range. These processes comprise internal processes such as automatic habituation and cognitive mechanisms such as reframing and meaning making, and external resources such as wealth and social relationships. Figure 4. The SWB homeostasis system. The plot illustrates the association between HPMood (y-axis) and the strength of challenges to the homeostatic system (x-axis). HPMood normally (a) fluctuates within the set point range (here: between 70 and 80). For moderate challenges (b), HPMood moves to the thresholds of this range, but a strong homeostatic defense keeps it within the set point range. Only for very strong challenges (c) can the threshold be passed (homeostasis failure). Figure adapted from Cummins (2010, p. 5). The homeostatic system is illustrated in Figure 4. The more the current level of HPMood approaches the thresholds of the set-point range, the harder the system works to keep HPMood within this range. Under ordinary circumstances, the system will therefore ensure that people’s fluctuating HPMood stays within their individual set point range, which explains why most people experience stable levels of SWB over long time spans. Under extraordinary circumstances, however, homeostasis may fail and the threshold may be exceeded, leading to significant changes in HPMood and, consequently, other aspects of SWB. Cummins attributes findings on long-term changes in SWB after life events to this kind of homeostasis failure. Over time, however, the homeostatic system regains control and HPMood returns to the set point range. Importantly, the assumption that the set point is biologically determined does not imply that it is fixed to a specific value or a specific range across the entire life span. Rather, just like other physiological parameters, the biological foundations of the set point for HPMood can change with age. In their attempts to reconcile the empirical evidence with a theory of SWB, Headey and Cummins appear to come to widely divergent conclusions. At a second glance, however, it becomes clear that these theories explain different phenomena. Although Headey typically refers to SWB, his empirical studies focus on the cognitive component of SWB, that is, life satisfaction. Cummins, by contrast, explicitly focuses on the affective component of SWB, that is, HPMood. Although correlated, cognitive and affective well-being are structurally and functionally distinct (Lucas, Diener, & Suh, 1996; Luhmann, Hawkley, Eid, & Cacioppo, 2012; Luhmann & Hennecke, 2017), and show divergent change trajectories over the life span (Stone et al., 2010) and after life events (Luhmann, Hofmann, et al., 2012). It is therefore plausible to assume that the mechanisms that account for stability and change are not the same for affective and cognitive well-being, and that distinct theories might be necessary to explain stability and change in these components of SWB. Anyone invested in improving people’s SWB inevitably wonders how adaptation to negative events can be expedited and how adaptation to positive events can be prevented or at least slowed down. These questions can only be answered if the mechanisms and moderators of adaptation are well understood. This is the goal of the Hedonic Adaptation Prevention Model (Lyubomirsky, 2011; Sheldon, Boehm, & Lyubomirsky, 2013), a comprehensive model that distinguishes two central paths to adaptation and identifies several moderators that affect the rate of adaptation. Similar to other presentations of this model, we focus on adaptation to positive changes, but it should be noted that the model applies to adaptation to negative changes as well. Figure 5. The Hedonic Adaptation Prevention Model. The effect of positive changes on SWB is attenuated by two separate processes. First, the emotional reaction to positive events associated with the positive change becomes weaker over time. Second, aspiration levels increase. Variety and appreciation of the positive events may moderate these pathways. Figure adapted from Armenta et al. (2014, p. 64). The full model is shown in Figure 5. A first basic assumption in this model is that major positive changes (e.g., getting a pay raise) are associated with a number of positive events (e.g., dinner in a fancy restaurant, an extended shopping spree, or simply being able to pay a bill on time). These positive events have a positive effect on SWB, but this effect can wear off over time (hedonic adaptation). Two separate pathways account for adaptation. First, positive events elicit positive emotions which in turn improve SWB, but both the link between events and emotions and between emotions and SWB become weaker over time. For example, a dinner in a fancy restaurant feels less and less special over time and is therefore associated with less joy and pleasure the more often one experiences it. Furthermore, even if one continues to experience positive emotions at the dinner, these positive emotions are less likely to have a lasting effect on SWB because they become part of the normal pattern. This pathway resembles what Headey and Wearing (1989, 1992) described as a dynamic equilibrium for events and SWB and what Frederick and Loewenstein (1999) described as desensitiziation. 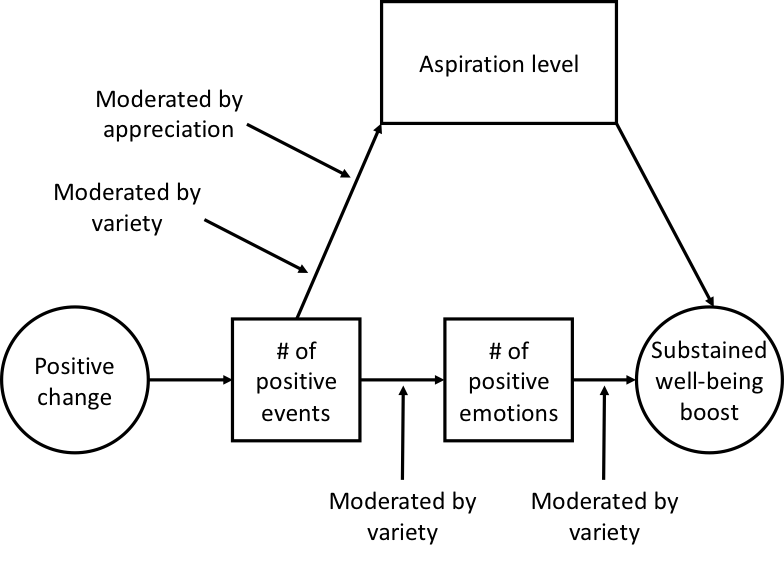 Second, experiencing a large number of positive events may raise people’s aspiration levels. The higher the aspiration level, the more likely people experience a discrepancy between their current and their desired state, which is experienced as negative affect and low life satisfaction (Carver & Scheier, 1990; Michalos, 1985). For example, the quality of food and service experienced in the fancy restaurant might soon feel normal, and restaurants that do not meet the new high standard are more likely to give cause for negative affect and dissatisfaction. This pathway is similar to a shift in hedonic adaptation levels proposed in some classical theories (Brickman & Campbell, 1971; Frederick & Loewenstein, 1999; Helson, 1948, 1964). In addition to describing the main processes of adaptation, the Hedonic Adaptation Prevention Model identifies two central moderators of these processes. The first, variety, relates to how similar or variable the positive events are. Specifically, the more variable the positive events, the slower the aspiration level rises and the longer these events elicit positive emotions which in turn improve SWB. A person who spends the new disposable income only on restaurant dinners will adapt to the pay raise more quickly than a person who spends the disposable income on a variety of different things and experiences. The second moderator, appreciation, relates to how much people appreciate the positive events. The more one is able to savor a nice dinner at a fancy restaurant, the slower one’s aspiration level rises. A short-term longitudinal study found initial support for the two pathways and the moderating effects of variety and appreciation (Sheldon & Lyubomirsky, 2012). The identification of these moderators has important practical implications. While changing aspiration levels and dampening emotional reactions may be automatic, both variety and appreciation can be controlled and might therefore be effective tools to speed up adaptation to negative events and slow down adaptation to positive events. We conclude this chapter by addressing four main open questions that need to be addressed in future research: (1) How should we study adaptation? (2) How does adaptation work? (3) Why is adaptation faster after some events than after others? (4) Why do some people adapt more quickly than others? How Should We Study Adaptation? As we discussed repeatedly in this chapter, studies on adaptation are subject to a number of methodological challenges. Here, we outline how an ideal study would deal with these challenges (for an in-depth discussion, see Luhmann, Orth, Specht, Kandler, & Lucas, 2014). The ideal study on adaptation should be longitudinal and focus on some discrete stimulus or event that affects people’s SWB. SWB should be measured multiple times both before and after the event to be able to determine whether and when people’s SWB returns to baseline after the event. Multiple measurement occasions are necessary to model nonlinear change trajectories. The intervals between measurement occasions are neither too short nor too long. If the intervals between occasions are too long, short-term changes may be overlooked (Uglanova & Staudinger, 2013). Conversely, if the intervals between occasions are too short and the study therefore ends too soon, it may not be possible to determine whether adaptation continues beyond the last occasion. The ideal study furthermore includes a matched control groups to disentangle changes caused by adaptation from normative changes and regression-to-the-mean effects. Finally, the ideal study includes different generations, age groups, time periods, and cultures to evaluate to what extent the observed adaptation patterns are influenced by age, cohort, period, and cultural effects. Of course, no single study can meet all of these requirements. This field of research therefore exemplifies the importance of cumulative research where multiple imperfect studies eventually lead to a comprehensive picture of the frequency and time course of adaptation. The theories discussed in this chapter propose a great variety of mechanisms of adaptation, ranging from automatic, physiologically driven processes (Brickman & Campbell, 1971; Cummins, 2010, 2014; Lykken & Tellegen, 1996; Solomon & Corbit, 1974) to stable personality differences pulling people back to a set point (Headey & Wearing, 1992) to cognitive changes (Frederick & Loewenstein, 1999; Helson, 1948, 1964; Lyubomirsky, 2011; Sheldon et al., 2013) to behavioral choices (Headey et al., 2014). As mentioned above, empirical studies suggest that the processes underlying adaptation may be distinct for affective and cognitive well-being, with automatic, homeostatic processes more likely underlying adaptation of affective well-being and cognitive processes more likely underlying adaptation of cognitive well-being. One frequently mentioned cognitive process is that the exposure to external stimuli leads to a change in the standard of reference against which new stimuli are judged (Brickman & Campbell, 1971; Frederick & Loewenstein, 1999; Helson, 1948, 1964; Lyubomirsky, 2011; Parducci, 1995; Sheldon et al., 2013). How exactly this standard of reference is formed in the first place and changes over time is still poorly understood. In particular, it is an open question to what extent the standard of reference used for SWB judgments is determined by past experiences (temporal comparison; Helson, 1948, 1964; Parducci, 1995), by comparisons with other people (social comparison; Diener & Fujita, 1997; Festinger, 1954), or by our ideal and/or ought selves (self-discrepancy; Higgins, 1987). A better understanding of how people judge their SWB is necessary to fully understand how and why these judgments change over time. Another cognitive mechanism is proposed in the AREA model by Wilson and Gilbert (2008). Wilson and Gilbert assume that events only impact SWB if people focus their attention on the event (Attend), which is a prerequisite for an emotional reaction to the event (React). Attention to an event dissipates over time and thereby reduces the emotional reactions to the event. Furthermore, as a consequence of attending and reacting to the event, people may be able to make sense of and assign meaning to the event (Explain). Once an event is completely explained, no further attention is paid to the event and the event cannot further impact SWB (Adapt). In their review of the literature, Wilson and Gilbert (2008) provide empirical evidence for each link in this cognitive process, but to our knowledge, this model has not yet been tested in its entirety. Tasks for future research include (a) conducting rigorous tests of specific mechanisms of adaptation, (b) distinguishing between affective and cognitive well-being when studying mechanisms of adaptation, and (c) integrating these empirical findings into a comprehensive theory of hedonic adaptation. Why is Adaptation Faster After Some Events Than Others? The average reaction and rate of adaptation vary substantially across different life events. Based on the notion that negative stimuli often have stronger effects than positive stimuli (Baumeister, Bratslavsky, Finkenauer, & Vohs, 2001; Cacioppo, Gardner, & Berntson, 1999), a common assumption is that people adapt faster to positive events than to negative events (Cummins, 2010; Larsen & Prizmic, 2008). Indeed, those events that appear to have lasting effects on SWB (e.g., unemployment, widowhood, disability) would be considered undesirable by most people. It is easy, however, to come up with counterexamples. Adaptation is quick after divorce (Luhmann, Hofmann, et al., 2012), another rather undesirable life event. Moreover, some studies find lasting positive changes in SWB after events such as cosmetic surgery (Margraf, Meyer, & Lavallee, 2015) and moving to a greener urban area (Alcock, White, Wheeler, Fleming, & Depledge, 2014). Furthermore, people might differ in how they evaluate the valence of a particular event. For example, the death of the spouse might have some positive connotations if it marks the end of enduring suffering. Finally, as suggested by opponent-process theory (Solomon & Corbit, 1974), even events with a clear positive or negative valence may lead to opposite hedonic reactions due to opponent processes. Thus, valence alone cannot explain the differences among life events. Obviously, events differ on many other aspects besides valence. Easterlin (2005) speculated that people only adapt to changes in economic factors such as income, but not to changes in non-economic factors such as relationships. Wilson and Gilbert (2008) suggested that event characteristics such as novelty, surprise, variability, and certainty about the nature of the event might account for differences among events because they affect how well people can make sense of the event. A one-week laboratory study on chocolate consumptions found that people savored eating chocolate more if they abstained from eating chocolate for an entire week than if they did not abstain (Quoidbach & Dunn, 2013), suggesting that adaptation to positive stimuli may be slowed down by deliberately reducing the exposure to these stimuli. Some events may also be associated with specific consequences that mediate the impact of the event on SWB. For example, the transition to parenthood is associated with a host of positive and negative changes which jointly determine how people react and adapt to this event (Nelson, Kushlev, English, Dunn, & Lyubomirsky, 2013). Exposure to a missile attack has been associated with increased avoidance motivation which in turn was associated with lowered levels of SWB (Van Dijk, Seger-Guttmann, & Heller, 2013). In sum, an open question for future research is which characteristics of events influence the rate of adaptation and why. Why Do Some People Adapt More Quickly Than Others? The rate of adaptation does not just differ across different events, but also among individuals experiencing the same event (Bonanno, 2004; Diener et al., 2006; Lucas, 2007a). Two general approaches to explore these individual differences can be distinguished. The first approach focuses on specific variables that are theoretically derived and examines whether these variables affect the reaction and rate of adaptation to life events. Most studies in this domain have focused on the Big Five personality traits, particularly extraversion and neuroticism. Results are mixed. Some studies found positive results. For example, adaptation to unemployment appears to be more negative for people high in conscientiousness (Boyce, Wood, & Brown, 2010; Hahn, Specht, Gottschling, & Spinath, 2015) and low in extraversion (Hahn et al., 2015); the reaction to spousal bereavement was found to be stronger for people low in extraversion and openness (Pai & Carr, 2010), adaptation to disability was found to be faster for people high in agreeableness (Boyce & Wood, 2011), and fluctuations in income were more strongly associated with life satisfaction among people high in neuroticism (Soto & Luhmann, 2013). However, these effects cannot be consistently replicated in independent samples (Anusic, Yap, & Lucas, 2014; Yap et al., 2012) and can vary even within samples, for instance between men and women (Boyce, Wood, & Ferguson, 2016). Other studies focused on more narrow personality variables and found protective effects of sense of mastery (Marum, Clench-Aas, Nes, & Raanaas, 2014), humility (Krause, Pargament, Hill, & Ironson, 2016), perceived control (Infurna et al., 2016), and external locus of control (Specht et al., 2011), but no significant moderating effects for perceived social support (Anusic & Lucas, 2014; Marum et al., 2014). The second approach is more exploratory and descriptive and aims at identifying different patterns of adaptation using latent growth mixture modeling (Muthén, 2006). This statistical procedure allows identifying and describing different latent classes that differ in their average SWB trajectories. Latent growth mixture models have been applied to various life events, including marriage (Mancini, Bonanno, & Clark, 2011), childbirth (Galatzer-Levy et al., 2011), divorce (Mancini et al., 2011; Perrig-Chiello, Hutchison, & Morselli, 2015), bereavement (Infurna & Luthar, 2017b; Mancini et al., 2011; Spahni, Morselli, Perrig-Chiello, & Bennett, 2015), unemployment (Galatzer-Levy et al., 2010), and retirement (Pinquart & Schindler, 2007). A typical result of these kinds of studies is that three to four latent classes can be distinguished, one of which is characterized by a relatively flat trajectory. This so-called resilient trajectory is often (but not always, e.g., Infurna & Luthar, 2017a) found to be the most common trajectory; however, latent growth mixture models are highly complex methods with strict assumptions that are often not met and, if violated, can lead to an overestimation of the prevalence of the resilient trajectory (Infurna & Luthar, 2016). In sum, more research is needed to identify variables that explain individual differences in reaction and adaptation consistently across samples and methods. After assuming for decades that SWB is highly stable, the field has recently made a significant turn towards recognizing that lasting changes in SWB are possible. This turn was at first entirely data-driven, ignited by the availability of large-scale longitudinal studies that track people’s SWB over long periods of time. Theory is catching up, as several promising models that explain both stability and change have been proposed in the past years. These models provide useful directions for future research, which is necessary to arrive at a complete understanding of the mechanisms and boundary conditions of hedonic adaptation. Preparation of this chapter was supported by grant #57313 awarded to Maike Luhmann by the Happiness & Well-Being Project, a joint program by the St. Louis University and the Templeton Foundation. We thank Nick Augustat and Vincent Beermann for their assistance in the literature search and formatting of this manuscript. Argyle, M. (1999). Causes and correlates of happiness. In D. Kahneman, E. Diener, & N. Schwarz (Eds. ), Well-being: The foundations of hedonic psychology (pp. 353-373). New York, NY: Russell Sage Foundation. Armenta, C., Bao, K. J., Lyubomirsky, S., & Sheldon, K. M. (2014). Is lasting change possible? Lessons from the hedonic adaptation prevention model. In K. M. Sheldon & R. E. Lucas (Eds. ), Stability of happiness: Theories and evidence on whether happiness can change. (pp. 57-74). San Diego, CA, US: Elsevier Academic Press. Brickman, P., & Campbell, D. T. (1971). Hedonic relativism and planning the good society. In M. H. Appley (Ed. ), Adaptation level theory: A symposium (pp. 287-304). New York: Academic Press. Cacioppo, J. T., Gardner, W. L., & Berntson, G. G. (1999). The affect system has parallel and integrative processing components: Form follows function. Journal of Personality and Social Psychology, 76(5), 839-855. Chow, P. I. (this volume). Psychology therapies and interventions that raise subjective well-being. In E. Diener, S. Oishi, & L. Tay (Eds), e-handbook of well-being. NobaScholar. Cole, D. A., Martin, N. C., & Steiger, J. H. (2005). Empirical and conceptual problems with longitudinal trait-state models: Introducing a trait-state-occasion model. Psychological Methods, 10(1), 3-20. Cummins, R. A. (2014). Can happiness change? Theories and evidence. In K. M. Sheldon & R. E. Lucas (Eds. ), Stability of happiness: Theories and evidence on whether happiness can change. (pp. 75-97). San Diego, CA, US: Elsevier Academic Press. Diener, E., & Fujita, F. (1997). Social comparisons and subjective well-being. In B. P. Buunk & F. X. Gibbons (Eds. ), Health, coping, and well-being: Perspectives from social comparison theory (pp. 329-357). Mahwah, NJ US: Lawrence Erlbaum Associates Publishers. Easterlin, R. A. (1974). Does economic growth improve the human lot? In P. A. David & M. W. Reder (Eds. ), Nations and households in economic growth: Essays in honor of Moses Abramovitz (pp. 89-125). New York: Academic Press. Easterlin, R. A. (2005). Diminishing marginal utility of income? Caveat emptor. Social Indicators Research, 70(3), 243-255. Ehlers, D. K., Salerno, E. A., Aguiñaga, S., & McAuley, E. (this volume). Physical activity interventions: Effects on well-being outcomes in older adults. In E. Diener, S. Oishi, & L. Tay (Eds), e-handbook of well-being. NobaScholar. Fraley, R. C., & Roberts, B. W. (2005). Patterns of continuity: A dynamic model for conceptualizing the stability of individual differences in psychological constructs across the life course. Psychological Review, 112(1), 60-74. Frederick, S., & Loewenstein, G. (1999). Hedonic adaptation. In D. Kahneman, E. Diener, & N. Schwarz (Eds. ), Well-being: Foundations of hedonic psychology (pp. 302-329). New York, NY US: Russell Sage Foundation. Haybron, D. M. (2008a). Philosophy and the science of subjective well-being. In M. Eid & R. J. Larsen (Eds. ), The science of subjective well-being (pp. 17-43). New York, NY US: Guilford Press. Haybron, D. M. (2008b). The pursuit of unhappiness: The elusive psychology of well-being. New York, NY US: Oxford University Press. Headey, B. (2008a). Life goals matter to happiness: A revision of set-point theory. Social Indicators Research, 86(2), 213-231. Headey, B. (2008b). The set-point theory of well-being: Negative results and consequent revisions. Social Indicators Research, 85(3), 389-403. Headey, B. (2010). The set point theory of well-being has serious flaws: On the eve of a scientific revolution? Social Indicators Research, 97(1), 7-21. Headey, B., Muffels, R., & Wagner, G. G. (2014). National panel studies show substantial minorities recording long-term change in life satisfaction: Implications for set point theory. In K. M. Sheldon & R. E. Lucas (Eds. ), Stability of happiness: Theories and evidence on whether happiness can change. (pp. 99-126). San Diego, CA, US: Elsevier Academic Press. Helson, H. (1948). Adaptation-level as a basis for a quantitative theory of frames of reference. Psychological Review, 55, 297-313. Helson, H. (1964). Current trends and issues in adaptation-level theory. American Psychologist, 19, 26-38. Holman, D., Johnson, S., & O'Connor, E. (this volume). Stress management interventions: Improving subjective psychological well-being in the workplace. In E. Diener, S. Oishi, & L. Tay (Eds), e-handbook of well-being. NobaScholar. Howell, R. T., & Howell, C. J. (2008). The relation of economic status to subjective well-being in developing countries: A meta-analysis. Psychological Bulletin, 134(4), 536-560. Kahneman, D., & Thaler, R. H. (2006). Anomalies: Utility maximization and experienced utility. Journal of Economic Perspectives, 20(1), 221-221. Kenny, D. A., & Zautra, A. (1995). The trait-state-error model for multiwave data. Journal of Consulting and Clinical Psychology, 63(1), 52-59. Knabe, A., Rätzel, S., Schöb, R., & Weimann, J. (2010). Dissatisfied with life but having a good day: Time-use and well-being of the unemployed. The Economic Journal, 120(547), 867-889. Larsen, R. J., & Prizmic, Z. (2008). Regulation of emotional well-being: Overcoming the hedonic treadmill. In M. Eid & R. J. Larsen (Eds. ), The science of subjective well-being (pp. 258-289). New York, NY US: Guilford Press. Layous, K. (this volume). Malleabilty and intentional activities. In E. Diener, S. Oishi, & L. Tay (Eds), e-handbook of well-being. NobaScholar. Lüdtke, O., Roberts, B. W., Trautwein, U., & Nagy, G. (2011). A random walk down university avenue: Life paths, life events, and personality trait change at the transition to university life. Journal of Personality and Social Psychology, 101(3), 620-637. Luhmann, M. (2017). Development of subjective well-being. In J. Specht (Ed. ), Personality development across the life span (pp. 197-218). London: Elsevier. Luhmann, M., & Eid, M. (2009). Does it really feel the same? Changes in life satisfaction following repeated life events. Journal of Personality and Social Psychology, 97(2), 363-381. Lyubomirsky, S. (2011). Hedonic adaptation to positive and negative experiences. In S. Folkman (Ed. ), The Oxford handbook of stress, health, and coping. (pp. 200-224). New York, NY, US: Oxford University Press. McMahon, D. M. (2006). Happiness: A history. New York: Grove Press. McMahon, D. M. (this volume). From the Paleolithic to the present: Three revolutions in the global history of happiness. In E. Diener, S. Oishi, & L. Tay (Eds), e-handbook of well-being. NobaScholar. Nelson, S. K., Kushlev, K., English, T., Dunn, E. W., & Lyubomirsky, S. (2013). In defense of parenthood: Children are associated with more joy than misery. Psychological Science, 24(1), 3-10. Parducci, A. (1995). Happiness, pleasure, and judgment: The contextual theory and its applications. Hillsdale, NJ England: Lawrence Erlbaum Associates, Inc.
Plomin, R., DeFries, J. C., Craig, I. W., & McGuffin, P. (2003). Behavioral genetics in the postgenomic era. Washington, DC, US: American Psychological Association. Riemann, R., Angleitner, A., Borkenau, P., & Eid, M. (1998). Genetic and environmental sources of consistency and variability in positive and negative mood. European Journal of Personality, 12(5), 345-364. Røysamb, E., & Nas, R. B. (this volume). The genetics of wellbeing. In E. Diener, S. Oishi, & L. Tay (Eds), e-handbook of well-being. NobaScholar. Røysamb, E., Nes, R. B., & Vittersø, J. (2014). Well-being: Heritable and changeable. In K. M. Sheldon & R. E. Lucas (Eds. ), Stability of happiness: Theories and evidence on whether happiness can change. (pp. 9-36). San Diego, CA, US: Elsevier Academic Press. Sheldon, K. M., Boehm, J., & Lyubomirsky, S. (2013). Variety is the spice of happiness: The hedonic adaptation prevention model. In S. A. David, I. Boniwell, & A. Conley Ayers (Eds. ), The Oxford handbook of happiness. (pp. 901-914). New York, NY, US: Oxford University Press. Spahni, S., Morselli, D., Perrig-Chiello, P., & Bennett, K. M. (2015). Patterns of psychological adaptation to spousal bereavement in old age. Gerontology, 61(5), 456-468. Stone, B. M., & Parks, A. C. (this volume). Cultivating well-being through positive psychological interventions. In E. Diener, S. Oishi, & L. Tay (Eds), e-handbook of well-being. NobaScholar. Thoemmes, F. J., & Kim, E. S. (2011). A systematic review of propensity score methods in the social sciences. Multivariate Behavioral Research, 46(1), 90-118. Veenhoven, R. (2014). Long-term change of happiness in nations: Two times more rise than decline since the 1970s. In K. M. Sheldon & R. E. Lucas (Eds. ), Stability of happiness: Theories and evidence on whether happiness can change. (pp. 167-200). San Diego, CA, US: Elsevier Academic Press. Wagner, G. G., Frick, J. R., & Schupp, J. (2007). The German Socio-Economic Panel Study (SOEP): Scope, evolution and enhancements. Schmollers Jahrbuch, 127, 139-169. Wilson, T. D., & Gilbert, D. T. (2008). Explaining away: A model of affective adaptation. Perspectives on Psychological Science, 3(5), 370-386. Yap, S. C. Y., Anusic, I., & Lucas, R. E. (2014). Does happiness change? Evidence from longitudinal studies. In K. M. Sheldon & R. E. Lucas (Eds. ), Stability of happiness: Theories and evidence on whether happiness can change (pp. 127-145). San Diego, CA, US: Elsevier Academic Press.